The bond between man and dog goes far back in the history of mankind and countless studies point to the benefits of owning a dog. Yet, there are times where the relationship between the two species takes a turn for the worst. An estimated 4.5 million dog bites are reported in the U.S. each year. Fortunately the vast majority of bites cause only minimal injuries. In almost 800,000 of cases however, medical care is needed and in rare cases, the dog bites lead to human fatalities. Although concerning, when we put these numbers in perspective there is about 1 death by dog for every 2.5 million dogs in the country. When compared to people being murdered by other humans, we have 1000 times more chances to be killed by one of our own rather than by our canine friend! Nonetheless, serious or fatal bites draw much attention and raise concern that often lead to drastic legal measures in an attempt to control the problem. Understanding the factors leading to such dramatic outcomes can help develop preventive strategies that may save both the humans and the dogs. A very extensive study was just published in The Journal of the American Veterinary Medical Association (JAVMA) and reveals some of the main factors that lead to fatal injuries from our best friend. According to the ASPCA statistics as well as a study a survey on Pennsylvania children (Beck, 1985), close to 50% of all children are bitten before the age of 12! Our children have one out of two chances of being bitten by a dog. The majority of these bites of minor and generally go unreported, but they point out to the fact that, clearly, there is an urgent need for better information to parents and kids. Unrealistic expectations that the dog should tolerate the child’s way of playing coupled with lack of knowledge of the dog’s stress signals can sometimes lead to catastrophic results. The sources of information are out there, but if parents feel confident that they know enough about dogs to keep everyone safe, they won’t look for ways to better educate themselves. Since the vast majority of dog bites are from a dog the child knows, whether the family pet, the neighbor’s or friend’s, a false sense of security can develop. 1/ There are ‘alarming deficiencies in the knowledge of communication and canine body language’. In other words, our children have very little to no understanding of dog behavior and cannot tell when the dog is pushed beyond his comfort zone. 2/ When children see themselves as having authority over the dog, they are more likely to try to ‘dominate’ the dog, to be the ‘alpha’. In other words, instead of developing a relationship based on mutual respect and understanding, they tend to forcefully impose their will on the animal. Many studies (Blackwell & al., 2007; Hiby & al., 2004) establish a direct correlation between confrontational techniques, or dominance based approaches and increased aggression from the dog. When the child or adult is associated with feelings of stress, anxiety or fear, the dog is much more likely to react. In most cases, that reaction is meant as a warning sign, a way to stop the perceived abuse. 3/ When children are left unsupervised with the dog the risk is higher. In addition to the reasons mentioned above, when children are allowed to walk the dog on their own, they cannot be expected to know what to do in case another dog comes running in their direction. They may try to protect their dog by putting themselves in-between the dogs and get bit. 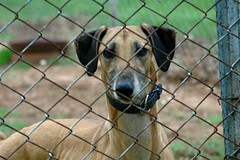 The dogs were neglected or abused by the owner (in 21% of cases). In 80% of cases, at least 4 of these factors were present. Unlike with other dog bites, when fatalities are involved, most dogs are resident dogs on the property(76%), not pets. They were kept outside on a chain or in an isolated fenced or indoor area. 15% were allowed to roam free. As mentioned above, when dogs bite, it’s generally a way to stop an unpleasant interaction, but the bite is mostly controlled, inhibited. When the dogs aren’t given the opportunity to form positive associations and attachments to people, they may inflict more serious bites when they feel the need to protect themselves. Many studies have shown certain breeds tend to bite more than others. This study however reports that in 80% of cases, the breed of the dogs involved could not reliably be identified. In only 18% of cases were they able to clearly identify the dog’s breed. A study reported that we don’t reliably identify dog breeds, even when working with dogs professionally (Olson & al., 2012), so when most reported dog bite fatalities come from media reports, the reliability of the information is in question. How can we prevent dog bites? Education plays a key factor in the reduction of dog-related injuries. The public needs to gain a better understanding of where to buy a dog and how to interact with dogs. With half the children being bit, this information needs to be part of the school curriculum. Making dog training an essential part of dog ownership. Few guardians understand the need to take their dog to training classes. More effort needs to be made to bring forth the idea that dog training is an integrate part of owning a dog. Socialize your dog and keep exposing your dog to people of all sorts, other dogs and different situations. Dogs that have the opportunity to experience the world regularly are more confident and less likely to feel threatened or scared by strangers or novel stimuli. Stay away from forceful and coercive training techniques that lead to stress and anxiety of the dog versus understanding, respect and positive associations between the two species. As a rule of thumb, if a dog trainer is repeatedly bit by his clients’ dogs, we should question his/her advice. This should be a clear sign that the trainer does not know how to read a dog. Don’t treat a dog unkindly. Abuse leads to stress and fear that can push the most docile animal to defend him/herself. Don’t keep your dog in isolation. Dogs are social animals and constant isolation and restrain is an abuse that can have serious consequence on their mental state and their overall behavior. Don’t approach dogs you don’t know. The polite and appropriate way to interact with a dog is to let the dog make contact and come towards us. When we don’t invade their space and allow them to make contact when they’re comfortable, we help them build the confidence that they’re safe in our presence. Supervise your dog when around young children or strangers. No matter how confident we are about our dog, children cannot be expected to pick up the dog’s stress signals and may push the dog beyond his/her comfort level. Don’t let your dog roam! Many dog attacks involve dogs that are running loose outside of their yard. Allowing your dog to freely roam the neighborhood is putting other dogs and people at risk. •Making dog training an essential part of dog ownership. I have long felt that rather than licence dogs we should be licencing “dog ownership”. I would like to see at the very least those applying for a licence to hae been through a course similar to the Canine Good Citizen test as it is here (Australia) — at least with a kowledge of dog ownership laws and the basics of understanding dog behaviour. Great article! Glad to read something in regards to dog bites that does not focus only on breeds. On a side note, what amazes me are the number of videos on YouTube that are of very young children smacking, biting, yelling at, and grabbing parts of dogs. In many of these videos, whoever is filming the child-dog interaction is laughing and egging the child on. I have yet to hear an adult tell the child to stop. I don’t go looking for the videos, but when looking for dog videos, so many have harmless titles that sound like the video will be cute. They are far from cute. For those of us who understand some dog body language and are smart enough to know that children tormenting dogs is asking for trouble, these videos are incredibly disturbing. All we need to do is watch videos such as what I have described, and we will get a clear insight into why so many “family dogs” who have “never shown aggression before” (what many dog owners say after their dog bites) end up biting children. Excellent article, explains the relationship between dogs and people very well. Great article! Can I use this in our little dog club’s journal? Absolutely, as long as you post the link to original blog and the author, please feel free to share. Glad you liked it! Thank you for such a GREAT article! Can you elaborate on the difference in relation to deaths what the difference between mismanagement, neglect or keeping the dog on the property as a non pet? Wouldn’t they all be the same? Lisa, I agree that keeping a dog on a property as a non pet is definitely an example of both mismanagement and neglect. However, there could be many other ways that dogs can be neglected or mismanaged while still be kept as a pet. I’m glad you liked the article. Please consider adding in “rescuing a dog” instead of focusing on buying… That may help save the millions of shelter dogs that die needlessly every year. This is outstanding information that should be shared with anyone who has a dog and/or a child. I will be sharing this with my students and clients – thank you! I don’t think the statement “50% of all children are bit before the age of 12! Our children have one out of two chances of being bitten by a dog.” is even remotely accurate. That would mean (as of 2010) 30 million kids (under 12) would have been bitten. If that were the case, dogs would have been eradicated. Not saying the information isn’t good, I liked it, but if you are going to throw out stats, they should be accurate. After all, 83% of all statistics are made up on the spot. Andrew, the way I interpret the stat is that of the children that are bitten, 50% of them are bitten before age 12. I don’t know but I suspect that these statistics might be right. I have four children — each of them was bitten by a dog — before they were 5 or 6. These dogs were not our dogs, but friends’ or in-laws’ dogs and the bites were not significant. One of my dogs was accused twice of biting a child. The first time is was a graze on the child as the dog tried to extract his head from a bear hug. (Child had a bare torso while doing this.) The other times was a nephew who should have known better, letting himself into the area where the dog had been put to keep him away from the throng of kids, and teasing the dog with his food bowl. Lessons learned. Don’t trust other people’s dogs OR children! When I got my German Shepard mix as a puppy. I did things to him that my 3yr old granddaughter would do to a puppy. I pulled his ears, tail, fur and got down by his face while he was eating. I took toys and treats away from him. He has never shown any aggression towards anyone or any other animal. Lol he has never barked at mail person or when someone knocked on door, or at anyone while waiting in car at a store. Was I right to raise him that way? He is now 9 years old. I remember one visitor (who was wished on me 🙁 who watched fondly as her preschool child was really bothering my dog. She said to me “Isn’t it mavellous what dogs put up with!” but did nothing to tell her kiddy that he should stop what he was doing. She then told me that “unfortunately” their dog had ‘not been good’ with the child so they’d had the dog put down! 🙁 I had her the whole day! I, of course, put my lovely and patient dog away from the child. I would have far preferred to put the child away! I have had a Pit, and a Rotti, and a 93% grey timberwolf hybrid. Also, I have dealt with a few of Vick’s Pits. of all of them, not a single one has caused any issues. They have all gotten along with other dogs, my cats, (once the initial hissing and spitting was over) my parents, and my child. In fact, I have had more issues with a yellow lab than I have with my “high risk” dogs. A lot of issues are caused predominately by the people, and not the animal. The worst part is that the people don’t even realize what they are doing. If you pay attention to your dog, you can get clues to how they are feeling. As far as Pits, yeah, they have been trained to do horrible things. They were also known as Nanny dogs, because people would leave their children with them and be ok with the fact. All of the bigger dogs used for protection or used working dogs have had a decade where people wanted to ban or kill them off. Rotties, Dobies, even German Shepards. I don’t see the point in allowing people to make dogs look bad. We do that enough to ourselves as people. What is the age range of dogs that cause fatal bites? I think this would be very illuminating to compare to dogs who do not commit fatal injuries. I say this because I have been around high-drive pups who were very dominant to other dogs, nearly starting fights. I did not want them to continue living with young children without firm training and management. I was very glad when one such dog was rehomed away from my cousins before she hit one years old. 6 Pings/Trackbacks for "New study sheds light on serious to fatal dog bites"